Cleaning and sanitation. This is a must and, without it, you will end up with bad beer at one time or another. Although not everything needs to be sanitized, make sure to sanitize anything that touches the beer after the boil. It's also important to properly clean everything; for example, the dip tube on the output of a keg that is hard to clean unless you have a very small (and very long) brush. Fermentation temperature. One of the key ways to be consistent from batch to batch is to ferment your beer at a constant temperature (and at the right temperature). Most ale yeast strains give off unwanted flavors and aromas if allowed to ferment too warm. Moreover, they can produce fusel alcohols which are reminiscent of jet fuel (don't ask me how I know this), have a warming feeling in the mouth, are usually harsh, and can give you one of the worst hangovers you've ever had. Most ale yeast strains ferment well at about 65-72F. Remember, however, that this is the temperature we want the beer to ferment at. Early on in the fermentation process when the yeast are very active and produce quite a bit of heat, that may mean an ambient temperature that is 5F below the target fermentation temperature. I typically ferment my ales at 68F with an ambient temperature of 64F for two weeks. I then cold crash my beers at 40F for at least three days which motivates the yeast and other protein solids to flocculate (clump together) and fall to the bottom. My beer is then ready to bottle or keg. If I dry hop, I do so in the primary fermenter and increase the ambient temperature to about 70F (well actually whatever my house ambient temperature is currently set at). I then cold crash. Lagers must be fermented at colder temperatures. Most of the time, I ferment them at 50F until 75% of the fermentation is finished, at which point I increase the temperature to 65F to stir up the yeast into cleaning up one of their fermentation byproducts: diacetyl. I then rack the beer (transfer it) to a secondary fermenter and lager the beer (very cold conditioning) for a month at 35F. It's then ready to bottle or keg. Cold crashing (or lagering) allows the beer to turn out crisp, clean, and pretty clear without filtering. 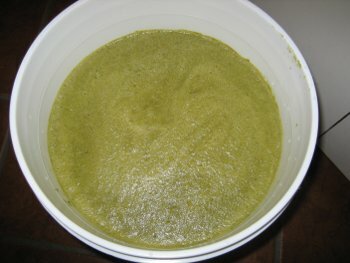 One can additionally use unflavored gelatin (added to water at 170F, allowed to bloom, and poured on top of the beer in the keg or before racking the beer in the bottling bucket) in order to further help in clarifying the beer. Another benefit of cold crashing and using gelatin is that, if any chill haze proteins (proteins that produce a hazing in the beer when it is cold) are in the beer, the gelatin will help take care of those too! Yeast and oxygen. Yeast is everything to beer. We might think that the water, grains, and hops determine the resulting flavors and aromas in the beer (and this is partly true), but it is the yeast that is the main workhorse and contributing factor to the resulting beer. So it is important that we pitch the proper amount of yeast cells and provide them with plenty of oxygen (O2) to start the fermentation process. One important thing to remember is that O2 is the yeast's best friend prior to fermentation (i.e., on brew day). After that, it is its worst enemy. So we must make sure that we do not introduce O2 once fermentation has completed. Pitching the right amount of yeast is a must and will greatly determine the resulting beer. There are a number of online calculators such as Mr. Malty that can assist with this. If pitching dry yeast, then we have no worries; we can just sprinkle a packet on top of the beer. If pitching liquid yeast, then it's usually time to make a starter (see my brewing process for how to do this). I typically make a starter about a week before brew day, allow it to fully ferment on a stir plate, and cold crash it for at least 48 hours. When ready to pitch, I decant most of the spent wort, swirl what little is left, and pitch. Properly oxygenating the wort prior to fermentation (but after cooling) is also crucial. Yeast first need to grow prior to fermenting the beer. This growth requires O2. During boiling, most of the O2 is driven from the wort so we must replace it. Commercial breweries target about 8-10 ppm dissolved O2 in the wort. We can achieve about 8 ppm with plain old air (which is 21% O2). To do this, we can agitate the beer. This was my preferred method prior to using pure O2. I used to let the beer crash into my fermenter as it was cooled and drained from my brew kettle. After that, I'd take my mash paddle (that has holes in it), hook it up to a drill, and spin it in the beer for about a minute. Now I use pure O2 that is passed through a HEPA filter and dispensed in the beer through a diffusion stone for about 20 seconds. The first time I ever used pure O2 I ended up with VERY vigorous fermentation. The krausen (foam that sits on top of the beer during fermentation) blew through the airlock and out of the fermenter. It was not too bad, but I could certainly tell that fermentation with pure O2 is much more vigorous than without. Mash temperature. There are a large number of variables that we can tinker with during brew day. Perhaps one of the most important in terms of affecting fermentation is mash temperature. When brewing using all grain methods, we mash the grains (usually for an hour) at some temperature. This temperature is crucial to determining how the yeast will ferment the beer. For example, if we mash at 148F or so, we will motivate the yeast to fully attenuate (thereby producing a dry beer with less residual sweetness). If we mash at 158F or so, there will be more residual sweetness in the beer once it's fermented. The temperature at which we mash essentially affects the enzymes in the grain and how they convert the starches in the grain into sugars. These sugars are converted to alcohol and carbon dioxide by the yeast. Mash temperature is not the only thing that affects how the yeast ferment the beer. Certainly, our choice of grains (among other things) is a contributing factor. Crystal malts, for example, produce long chain sugars that yeast have a hard time fermenting thereby leaving residual sugar in the finished beer. Malts such as Munich or Vienna tend to produce maltiness (not sweetness) in the finished beer. Water chemistry. Although we can brew great beer without paying attention to the water that we use, we will never be able to truly be consistent or to exactly clone our favorite commercial beer unless we address the chemistry of the water we use to brew. In addition, proper water chemistry (and pH) can allow us to accentuate malt or hop characteristics in the beer. I used to brew with spring water that was filtered and passed through reverse osmosis. One day I decided to try my city's tap water, and the result was tastier beer. At the moment, I don't personally alter the chemistry of the water I use to brew, but certain minerals in the water can affect the flavors and aromas in the beer as well as the fermentation process (although perhaps not anywhere as influencial as other processes such as yeast and oxygen for example). There is also the possibility that the overall efficiency of our all grain brewing system can be affected by water chemistry and water pH, particularly during the mash.